ACRLog welcomes a guest post from Candice Benjes-Small, Head of Information Literacy and Outreach, and Alyssa Archer, Instruction Librarian at Radford University. “If I have to sit through YET ANOTHER freaking ‘professional development’ session based on these cockamamie theories, I am going to pluck my eyeballs out and throw them at whatever charlatan the administration hired to conduct said session.”- professor on an online academic forum discussing learning myths, including the pyramid. Some educational myths just can’t be killed. 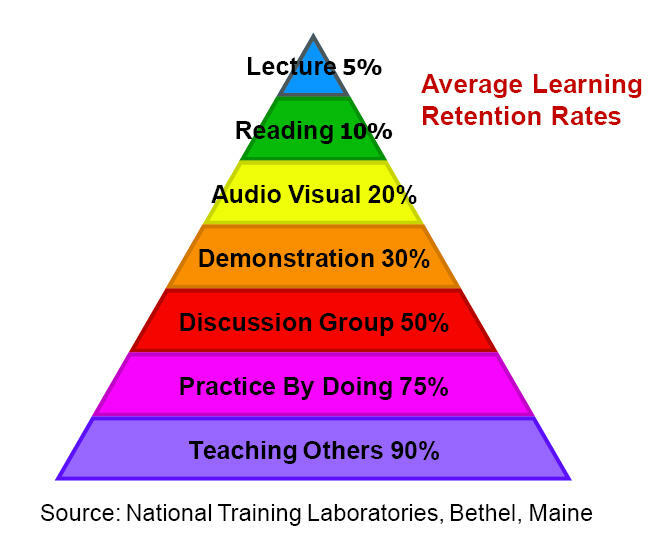 Case in point: the learning pyramid. If you’re involved with student learning, you are probably familiar with the Learning Pyramid. This diagram breaks down different modes of learning and argues that more active modalities are better for long-term learning: we remember10% of what we read, 20% of what we hear, 30% of what we see, and so on, all the way up to 90% of what we do. Just in the last few weeks, we have witnessed two experts in separate presentations (one in librarianship, the other in education) refer earnestly to the pyramid. And while we didn’t gouge our eyeballs out, it made us both wince. This is a zombie learning theory that refuses to die. 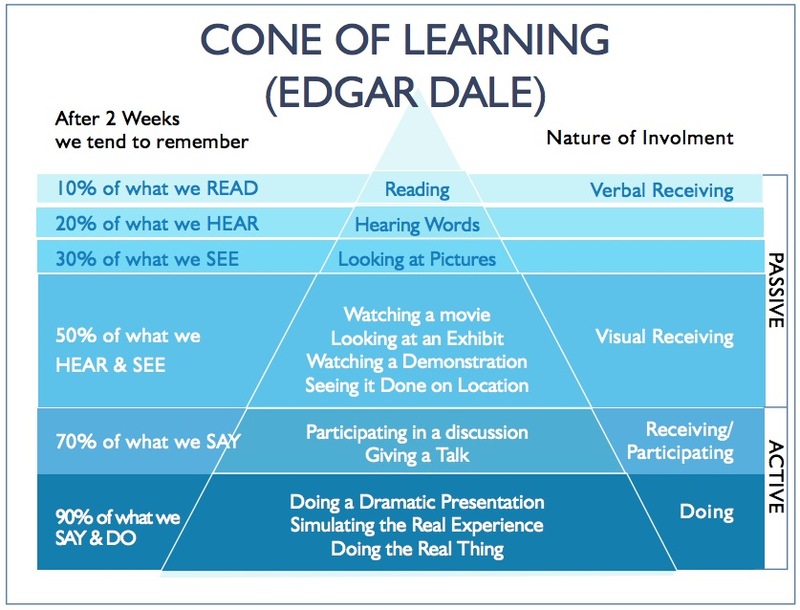 Whether it’s called the Cone of Learning or the Learning Pyramid, or demonstrates retention rates by another graphic, it keeps getting its head methodically removed by a dedicated cadre of researchers, yet rises up again in search of more brains. In this post, we’ll review the history of the pyramid, why it’s wrong, and why it never dies. 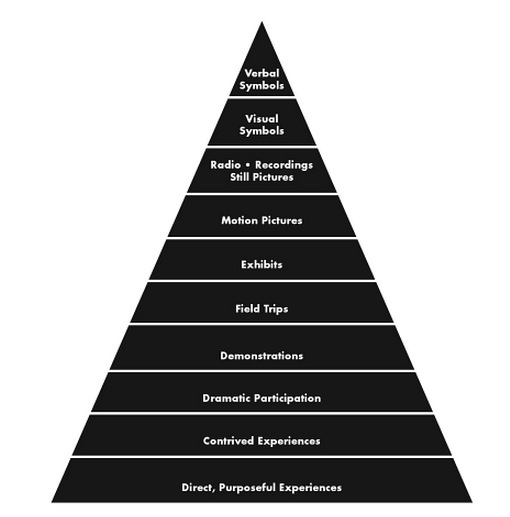 Edgar Dale, an expert in audiovisual education, created a model in his 1946 book Audio-Visual Methods in Teaching that he named the Cone of Experience to discuss various modalities/channels of imparting information. His cone did not refer to learning or retention at all, instead modelling levels of abstraction: words being the most abstract in his model, at the top of the cone, and real-life experiences the most concrete, and at the base of the cone (Lalley & Miller, 2007, p. 68). Take a look at the image below left: note that there are no percentages listed, this is purely a theoretical model. Dale did not value one mode over another, but argued for a wide variety of modes depending on context (Molenda, 2004, p. 161). Researchers speculate that Dale based the Cone on an earlier theoretical graph (below right) from 1937’s Visualizing the Curriculum, by Charles F. Hoban, Charles F. Hoban, Jr., and Samuel B Zisman. 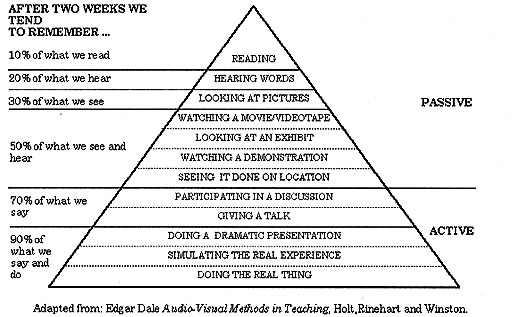 Edgar Dale’s Cone of Experience from the first edition of Audio-Visual Methods in Teaching, a model of abstract to concrete experiences. 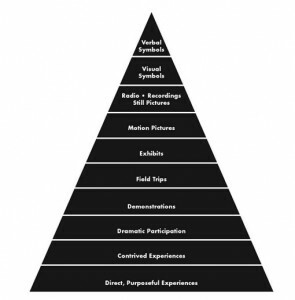 Despite Dale’s warnings, the Cone of Experience was misapplied and renamed the Learning Pyramid. However, there is no conclusive evidence to back up these average retention rates. How did this happen? Examples of what the Cone of Experience became. The links to the images above have been removed to protect the mistaken. They are just two examples of the hundreds found on a simple Web search. Who first came up with the retention rates associated with the learning pyramid is murky, but researchers have theories. Molenda (working with several sources) believes the development involved Paul John Phillips, an instructor working at the Aberdeen Proving Ground’s Training Methods Branch during World War II. Phillips returned to work after the war to the University of Texas, where he trained members of the petroleum industry. The University of Texas records tie Phillips to the retention rates used in the pyramid. However, when Michael Molenda contacted both the University of Texas Division of Extension and the archivist at the Aberdeen Proving Ground, they could find no research regarding the percentages. In Molenda’s history, the learning pyramid with retention rates was first published in a magazine article in 1967, by D. G. Treichler. The author included no citations or evidence to back up the retention rates, but Molenda suspects that they probably they came from Phillips, as he distributed training materials to the industry while at UT. However, the current propagator of the learning pyramid is the unassociated NLT Institute for Applied Behavioral Science, which claims to have research from the early 1960s which supports the pyramid, but has lost the evidence. Will Thalheimer points out in an excellent post on the pyramid, that this lack of evidence negates all credibility. Even if research were conducted at one time, we cannot trust it. The context has been lost, as well as the ability to retest the method and examine it for errors. What kind of research results end up in such tidy percentages, all multiples of 10? How would one even develop a method for testing such broad claims? Do we really believe a learner can remember 90% of anything? Can an activity be separated from its content and be given credit for learning? Many distinguished authors have gutted the pyramid’s claims. Educational expert Daniel Willingham provides excellent arguments against the pyramid related to oversimplification; providing an optimal learning experience does not boil down to the instruction method. There are many different variables that impact learning. Our field has also tried to dispel the myth. In her book Reflective Teaching, Effective Learning, Char Booth explains another danger of the pyramid, that relying too heavily on the idea of mode strips away designing instruction for differences in context and content (2011, p. 41). Booth’s anecdote about how she embraced the pyramid because of its implications for student engagement illustrates another flaw with it. The pyramid is a visual sighting. If we only remember 30% of what we see, then a picture of the pyramid should not have such a dramatic memory impact on so many people. Despite the pyramid having been debunked in many venues for decades, it continues to show up in educational presentations and literature. How people learn is a complex topic, complicated by advances in neuroscience and cognitive psychology research. It’s natural that we should seek commonalities in learning. As the authors of the white paper “Multimodal learning through media” state, “The person(s) who added percentages to the cone of learning were looking for a silver bullet” (2008, p. 8). Shortcuts to ‘what works’ would be especially tempting to librarians who do not have extensive training in education. In the library field, both of us have attended presentations where the speakers used the pyramid as a quick way to reinforce the importance of engaging students during class. “Remember, people learn better when they are doing!” we are exhorted, as the famous image appears in a slide. The “short cut” is not only a way to simplify complicated processes to ourselves, but to rapidly convince others that student activity is a worthy goal. Finally, the pyramid speaks to us. When discussing the pyramid with other instructors, we often find ourselves agreeing to the “truthiness” of it: intuitively, it just feels right. Of course being active and participatory should lead to more learning than does more passive activities, like reading or listening. Who among us has not sat in an auditorium during a lecture (library or otherwise), surrounded by sleeping audience members? In fact, the research supports that lecture is of limited use when it comes to retention of material; people’s minds tend to wander after a short period of time. It seems common sense to conclude that methods alternative to lecturing would be better. And if we already believe that other methods are better, then when we view the learning pyramid, confirmation bias kicks in, prompting us to not question premises that support what we already believe. 2. Think multimodal. As has been mentioned, Dale did not intend to create a hierarchy of mental activities, but to suggest there was a continuum from which to choose. People’s attention spans are short, but they do tend to retain more when the instructor mixes it up: interspersing short lectures with peer collaboration, or after reading a passage, interacting with an online tutorial. 3. Student engagement. The literature strongly supports that active learning exercises promote students thinking and caring about the material. This greatly aids retention, but it also helps lessen library anxiety and gives students a more positive feeling about the library sessions. Since the 1960s, experts have been trying to convince people that the learning pyramid is bogus. But for every article written exposing its weaknesses, there seem to be dozens of instances where it is invoked as truth in presentations, websites, and trade publications. We hope that having read this post, you will join the forces of pyramid slaying and base your instructional choices on valid research, not educational myths. The other aspect of learning that should be added to this is that everyone has different learning styles. My first thought on seeing the pyramid was “how can that be true? Everyone learns in their own way.” Multimodal teaching makes the most sense, not only because people retain more as their attention is held, but also because it allows different kinds of learners to interact with the material in different ways. Re: possible future post on Learning styles — please do! Thank you for this debunking! I too have seen the Learning Pyramid here, there, and everywhere, but hadn’t given it a great deal of thought. I especially appreciate your links to further reading on active learning. Pingback: Sharing practice: Why we should try and do better. | Careerschap | The musings of a careers professional in the higher education sector. I first came across the debunking of the learning pyramid in this blog post by Will Thalheimer. It is indeed amazing how many people uses it! Regarding learning styles, research has not been supportive. See links to some references! The primary citation used is a 3M PDF of a brochure which makes the claim, citing un-referenced “behavioral research” – in essence, writers reference a reference which lacks the reference. Then it gets repeated so many times, in so many powerpoint, that it sounds truthy. I exhausted my research capabilities in 2012 and came up empty, but offer a still unclaimed $60 cash prize for the person who can find the alleged original research. I am pretty sure the answer is buried below the base of the learning pyramid. The learning pyramid is not the only theory/concept that was debunked but continues. Saba (2000) states that “distance education research has been dominated by quasi-experimental research which compares the effectiveness of distance education to classroom instruction, face-to-face education, or traditional education”(p. 2). Although the “no significant difference” answer to this comparative study question was provided by Crump in 1928, this topic and method is still a focus of and is prominent in distance education research (Moore & Kearsley, 2005, p.240). Moore, M. G., & Kearsley, G. (2005). Distance Education: A systems view (2nd Ed.). Belmont, CA: Wadsworth Cengage Learning. Pingback: Ripples of influence in a CoP, moving through the 90-9-1 rule | Agile KM for me… and you? Curious. It’s interesting that the opponents to the simplified summary called “The Learning Pyramid” are Lecturers (statistically 13% of the USA population that are highly literate) that never refute that the findings are essentially true but that there is no scientific study to back it up. I stipulate that the creators of the Pyramid have publically stated that the original data cannot be found. Note: What might come next in response is an attack on NALS data or an attack on an over simplification of the findings. Whether one can physically measure the sun or not, it still is round even at a distance. Instead of attacking, how about making a positive contribution by doing the scientific study on the methods that contribute to learning retention? Respectfully, Thank you for your time and consideration. HI James, I think the point being made is that there is no research, or at least little of it that is reaching the trenches of education (at least here in America). It is shocking to see how many PHDs use Dale’s cone of perception as the basis for their educational models. Do a google search on the cone of perception and see it repeated and repeated over and over, by people who know better. Also if the research is lost, but the cone of perception is true, it should be easy to reproduce. after all that is what science is all about. To reproduce results. Perhaps it is time these PHDs who use the cone of perception start trying to reproduce those numbers. They will find out that they can’t, but I guess that is why education is a soft science. Pingback: Dale’s Cone of Experience- Reflection on theory | Miss Who? Miss Ferguson! 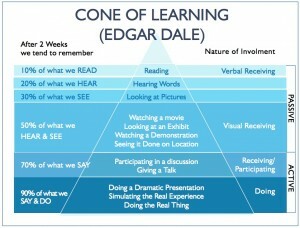 My first time seeing the Learning Pyramid was a class handout during my doctoral program, taught be a protege of Edgar Dale. It’s source was cited as Narional Training Labs, Bethel, Maine. I’m reminded of something. Many years ago Jerry Seinfeld was told that he needed to shorten a comedy show he was planning because people didn’t have that long of an attention span. Jerry replied that people only had a short attention span when they were bored. When they were entertained they could sit there for hours. I have to think the same applies to learning. I can’t help but think that perhaps the need to cling to outdated or unproven methodologies may stem from the desire to attach blame or accountability to a method rather than to a teacher’s ability to engage the minds and imaginations of their students. Some guy who wants to get his 5 minutes glory should debunk also this theory (practically identical to the cone)! My students say they retain 10 times more when they are lecturing instead of just hearing professor’s lectures (and not only mine!). Participative teaching methods are obviously so superior to passive ones that obviously no researcher bothered him/her with unnecessary analysis. Should we make big research about the fact that in the winter is colder than in the summer? Loved it. Thanks for shedding light on this. I’ve been teaching part time my whole life and was preparing to include the pyramid on my lecture tonight but thought… better check out some criticism on this so I ended up on your page, directly from Wikipedia. I truly appreciate being able to check the other references here on the comments section which completely debunked this theory.